About: This smart bolthole in the heart of the city’s financial district takes the space occupied by the former Bar One Ten, and even earlier than that the Scottish Union and National Insurance Co offices. It’s a grade-II listed building packed with period features and has real warmth and charm. Downstairs there’s another bar which is available for hire for private events. Why it’s so good: Has to be the building’s character. After a few minutes here you can pretend to be an expert on the finish of aged Aberdeen granite or unique sheen to rare Italian marble. About: The artisan Great Western Arcade just gets better and the opening of Loki has given the shopping destination a new dimension. It is currently Decanter UK Wine Merchant of the Year outside London and claims to be the only fine wine merchant in Birmingham’s business district. Why it’s so good: Gives you chance to show off your knowledge of the grape to potential clients. Just don’t mess it up with ‘one too many’. About: This newcomer, a joint venture between Purity Brewing Company’s Paul Halsey, Simpson’s chef-patron Andreas Antona and former Mitchells and Butlers director Martin Hilton, is housed in a lovely Grade II listed building that had been empty for years. Think modern pub with great grub. Why it’s so good: Expect craft beers and simple but high-quality food made with top-notch ingredients and served in stylish urban surroundings. About: We’ve allowed a double entry from Birmingham supercook and TV chef Glynn Purnell. Gingers is the place to entertain if you’re watching the budget, but still keen to impress. Push the boat out and it has to be Michelin-starred Purnell’s on Cornwall Street for some of the best, most innovative food you’ll ever try. Why Purnells is so good: The men from Michelin know their stuff and Purnell’s has held its star for four years running. About: For a down-to-earth, sticky-carpet alternative to Colmore Row&apos;s swankier venues, where if you tasted all the guest beers on tap you&apos;d never get back to your desk in a straight line. Why it&apos;s so good: They take their real ales seriously here. Better free-up your diary for the day. About: If you fancy some after-work wag-spotting, head to this sister venue to long-established San Carlo&apos;s. Get past the petulant Italian waiters and supermodel cloakroom attendants and you&apos;ll find some great wine. Why it&apos;s so good: The exquisite chichetti - Italy&apos;s small-portioned answer to Spanish tapas. About: Cornwall Street is the place to be for the best in modern British cuisine and Opus is rarely found wanting. Chef director David Colcombe takes seriously his commitment to fresh, sustainable produce and has won awards for this. It’s a Birmingham Post favourite. Why it’s so good: Ticks all the boxes for business... great restaurant and plenty of private dining and function options. About: The daddy of all of Birmingham’s business district bars. Some company execs might as well have a desk here, but it seems to do the trick and many a deal has been sealed within these four walls, particularly on a Friday afternoon. A smart bar at the front leads through to an equally-smart restaurant serving a great selection of dishes including the best fish finger sandwich you’ll taste for miles around. Why it’s so good: Great beer selection. Good food. Always a vibrant atmosphere. It just works. About: Primitivo is one of the most underrated independent restaurants in the city centre, serving decent Mediterranean food in a great location on Barwick Street. Should the redevelopment of Snow Hill rail station ever go ahead it’ll be in a prime spot for more passing trade. 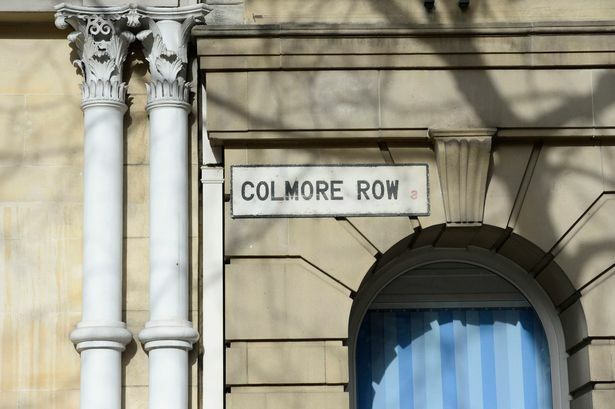 Why it’s so good: Something of a stalwart in the Colmore district, for good reason. About: One of the best Indian restaurants in Birmingham, let alone the financial district, serving everything from traditional favourites to adventurous modern dishes. First opened in 2006 but still feels as fresh and new as it when it served its first poppadum. Why it’s so good: Good choice of menus to cater for any family event or meeting. About: Situated in the Church Street epicentre of the Colmore district with Hotel du Vin directly opposite, Home Deli serves some of the best coffee in the area. Quirky decor with mismatched furniture and an equally eclectic cafe-style menu make this a firm favourite of the Birmingham Post. Why it’s so good: Perfect location. Always a lively atmosphere. About: Great independent cafe on Newhall Street. Describes itself as a ‘casual diner’ in the heart of the financial district. Birmingham Post writer Mary Griffin singled out the cheeriness of the staff in a review last year. She also made special reference to the mouthwatering choice of cakes on offer. Why it’s so good: Another independent diner that stands out for service with a smile. Worth a try. Hotel Du Vin Bistro, Church Street - has upped its game with new and improved menus. Utopia Bar, Church Street - great location for ease of post-work gatherings. The Old Contemptibles, Edmund Street - one of the best pubs in the city centre with great guest ales and welcoming atmosphere.